WHAT ARE MERCURY DISPLACEMENT RELAY CONTACTORS? Mercury displacement relay contactors are devices for repeatedly establishing and interrupting electric power circuits. They make and break power circuits to such loads as electric transformers, capacitors and heaters. 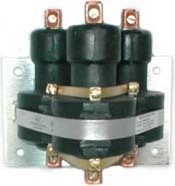 Mercury contactors are used frequently for industrial heater control of resistive heaters. They are used to control high-voltage circuit with a low-voltage signal or to control a high-current circuit with a low-current signal. HOW DO MERCURY DISPLACEMENT CONTACTORS WORK? A mercury contactor uses a pool of mercury, inside a glass sealed tube, to electrically connect two contacts. Basically, a mercury wetted contact relay consists of one or more glass switch capsules surrounded by a coil. When the coil is powered causing a magnetic field, the plunger assembly inside the glass capsule is pulled down into the mercury pool, which is in turn displaced and moved up to make the contact with the electrodes. When the two contacts wetted with mercury are joined, the area of contact between the surfaces is somewhat large because a fillet of mercury surrounds the mated surfaces. When the two surfaces are separated, the mercury stretches into a thin filament and then breaks at two points that isolate a thin rod of mercury in the middle. The thin rod then snaps into a ball and drops to the bottom of the switch. Thus, in effect, the mercury wetted contact relay provides a new contact surface for each closure. A mercury displacement contactor ideally runs 3-8 million overall cycles. When used 24 hours a day in a heater application, there may be 3 million on/off cycles in a single year. Mercury displacement relay contactors are all designed and built to meet the most exacting demands of industry. They have proved their ability to stand up under the most adverse conditions of temperature, dust and moisture, in all types of applications. The contactors are hermetically sealed with high quality glass to metal seals. The stainless steel tube is totally encapsulated in high grade UL approved epoxy to prevent moisture damage and voltage breakdown through the protective coating. The coils are wound on compact nylon bobbins and molded onto the metal tube to provide minimum power loss. This allows for low coil power to actuate the contactor. This also enables the units to handle high loads with minimum derating due to higher ambient temperatures. Inert gases internally prevent excessive arcing between the mercury and the electrodes which enables the unit to function for millions of cycles with very low contact resistance, and minimum deterioration of the internal parts. Normally Open contacts connect the circuit when the relay is activated; the circuit is disconnected when the relay is inactive. This is ideal for applications that require switching to a high current power source from a remote device. Normally Closed contacts disconnect the circuit when the relay is activated; the circuit is connected when the relay is inactive. This is ideal for applications that require the circuit to remain closed until the relay is activated. Click here for more information on Mercury Contactors.